Toru Shimizu is Monokraft. He designs furniture for you. Well maybe not you specifically, not you just yet. Because this is furniture for life, and maybe you’re still not quite settled. Plus maybe it’s a little expensive. But then, the design is classic, simple, and with flair. You can see it beautifully on his website. Curved joinery, hidden aluminium reinforcement in the tables. Enduring strength and flatness. And you get to work out the design with him, details like seat height, or whether you want a strong or subtle grain. The materials include iron-hard Japanese nara oak, and the pieces are made by craftsmen in Higashikawa, Hokkaido, where the same artisan who starts the job sees it through to completion. So maybe it’s not that pricey. You sit in Monokraft’s corner shop in Kuramae, at this hard yet welcoming furniture, unembellished but not austere, and feel you could sit here for a very long time. You see people stroll past and peer in. The airy windows and timber attract some, but most who enter know it because they’ve studied it on the web. The store doubles as a workshop and an office for Shimizu’s graphic design projects. He recently produced a painstaking series of three illustrated children’s books on food, biology, and the Earth’s water supply. Monokraft also sells items including wooden utensils and clothes hooks, notebooks, and bookshelves. Shimizu speaks quietly and with enthusiasm. Lately, he has been dressing small pieces of nara. They might be used as plates or trays. Each has dark and light streams of cloud-like grain, and ink-blot knots, like abstract pictures. 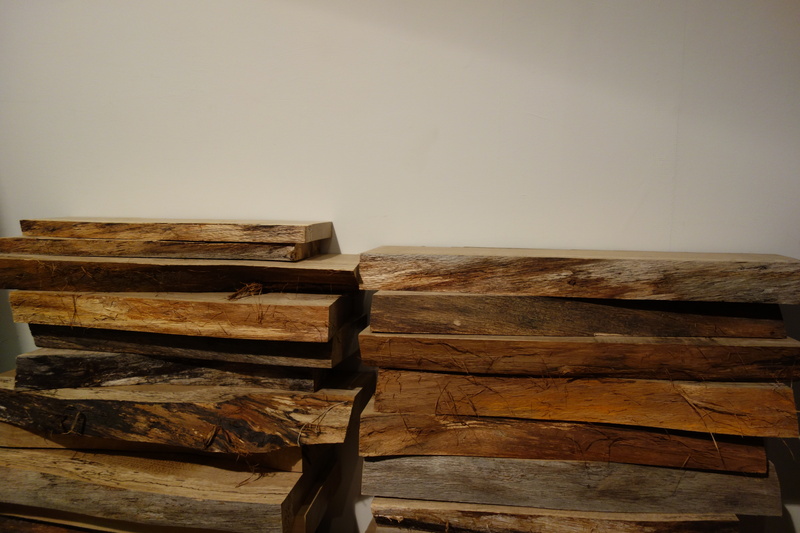 The manual planing work is very straightforward – he is only making planks – but it takes time and he is engrossed in it. Perhaps it’s the minimalism. He says, I can’t help feeling there’s a meaning in this, but I can’t say what it is. He graduated in architecture from university, then in graphic design from college, worked in various design and drafting jobs and as a freelance, then from 2009 took a year of furniture-making at Swedish crafts institute Capellagården. Being limited in language was no problem, he says. The teachers demonstrated well. They also told him to abandon his own visual language – his drawings and plans – and not to think so much. He learned, instead, to feel where his materials want to go. The new methods inspired work, he says, that he would not have come up with in Tokyo, including an elegant, simple cabinet. He was attracted by the craft tradition of the neighbourhood, its continuity amid upheaval. Back home in 2010, he fitted out his wife’s atelier, on the river at Komagata. She works with textiles, and together they are design partners. 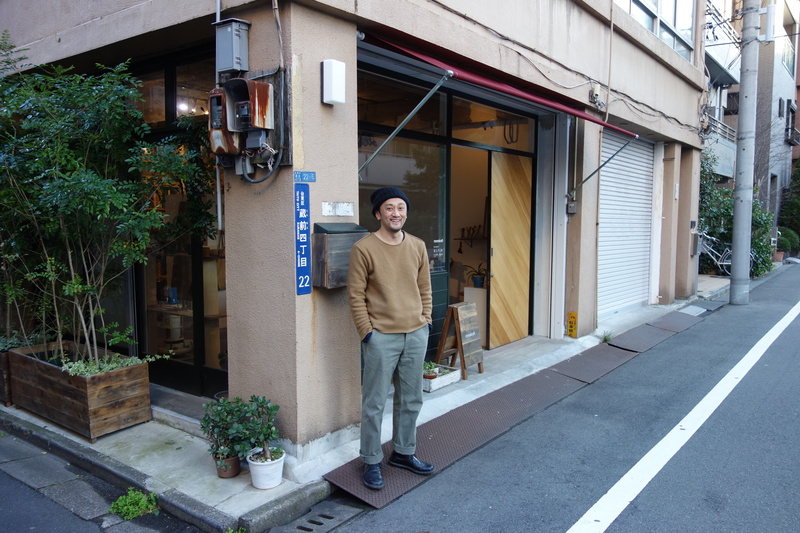 He liked the area a lot – so much that last year he moved his workshop here from Aoyama. He says like many designers who previously had bigger plans, he rethought his priorities after the financial shock of 2008 and then the 3/11 disaster. He was attracted by the craft tradition of the neighbourhood, its continuity amid upheaval. His ambition is to live from his woodwork alone. He says, I like selling my furniture directly from my shop here, to people who drop in. He likes the relationships his work creates. Sounds like a lovely shop.